Wart is Back! The evil king has escaped from Super Mario’s unconscious and invaded the Mushroom Kingdom. Wart has kidnapped Mario and rendered the kingdom defenseless. Princess Peach has sent for Samus in a last-chance hope that she may be able to defeat Wart and save the land. 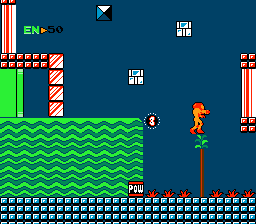 As Samus, you must traverse the many obstacles and dangers that Wart has set up throughout the 5 areas as well as collect Mario’s super powers to help you on your journey. 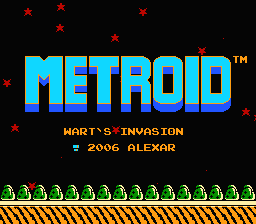 Wart’s Invasion is an extremely unsatisfying and annoying experience. 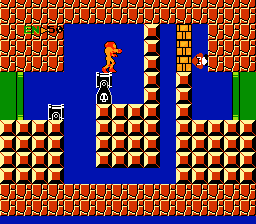 The hack is littered with tiles from a few Mario Bros games, but even those are strewn about the rooms randomly in an effort to mask the pervasive stench of terrible design shown throughout the hack. One good thing is that this hack is pretty linear, and there is no need to bomb random spots in the floor to advance. The sprite work, while sometimes quite silly, is actually pretty nice. There is an error there even which I will get into later. But suffice it to say the hack at least has an interesting, if somewhat cluttered and unkempt look to it. The major issue with this hack is simply just getting around the world. There are what seemed like an infinitude amount of bomb-jumps required to traverse your regular hallways and transition rooms. Literally every, single, one of them. The shootable/bombable blocks are such an annoyance and it was turned up to the extreme. You are constantly in rooms where you will be spending 5 minutes just making your way through convoluted passages filled with these blocks. That is not an exaggeration. On top of that, the thing that might get you to play it again is messed up. After beating the game, instead of playing as Samus in her swimsuit, you play as Mario. 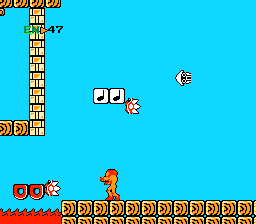 I don’t know for sure, but I am assuming that the item sprites were supposed to change to Mario things as well. (Mushrooms = Energy Tanks, Fireflowers = Missiles, and so on.) Unfortunately, this was done in reverse. 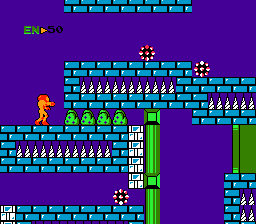 Samus is picking up Fireflowers and Mushrooms, and Mario is picking up Missile Tanks and Energy Tanks. It is just another indictment of how little care seemed to go into this hack. I cannot even begin to recommend this hack. The Mario stuff might have been fun to see, but it is much more of a chore to “play” that any enjoyment is nearly impossible to get out of it.